Notice that the title is left a little open ended. Pissed about the Rams leaving St. Louis? Pissed the Rams made the Super Bowl and are having great success in LA after many horrible years in St. Louis? Pissed that the NFL even allowed the Rams to leave despite breaking many of its internal rules to include St. Louis offering to fully fund a brand new Stadium? Shall I go on? Only one of those is a fact of course, and that is the fact that the Rams play for LA now. St. Louis showed every year to even the last year that the Rams where in St. Louis that they could more than support the team. Just look back at the massive crowds and sold out stadiums of 1999 and 2001 Rams in St. Louis when they went to the Super Bowl. Even in the first few decline years, St. Louis showed pride and supported the team with heart and passion. When the lackluster play and piss poor management started to go on for over a decade, of course ANY city would start to lesson the support for a subpar product. And that’s exactly what Stan Kronke wanted. With that in mind, I’ll get on to my main point. I’ll start off by saying one, I have absolutely nothing against the team itself. I enjoy watching Todd Gurley do his thing. What the coaches have done to turn this team around is absolutely incredible. I wish nothing but the greatest success for the players and the coaches in their careers, if they are on any other team but the Rams that is. What I absolutely can’t stand is watching Stan Kronke profit from this whole situation. I wish nothing but the worst for the man as he is just a greedy, selfish, evil man who as I’ve quoted before, once he Croaks, his grave will most likely become a public urinal. This man is a lousy human being and thinks he can do anything he wants. Just look at the story of where he forced people to sell their land in Texas so he could build a mansion. Land that families owned for generations and he forced them to sell just because he has more money. A few of the tenants even committed suicide due to this action of losing their home and land. I don’t wish death upon him so this is by no means a threat. I just wouldn’t have an inkling of sadness for the man if he lost all his wealth and was brought down to earth to what the rest of us who actually work for a living have to deal with. I mean seriously, I’ve seen on multiple occasions him wearing sunglasses at night with his rat nest for hair flopping everywhere. Is he that cheap he even refuses to pay for a decent haircut? Back to my point. He absolutely threw St. Louis under the bus in many ways and straight up lied about it. He attempted to convince the fine people of St. Louis that he “would do everything in my power to keep the Rams in St. Louis.” This is a Quote from him from 2014. Funny thing is, his Chief Operating Adviser for the Rams Kevin Demoff was quoted saying Kronke called him in 2012 to discuss his view outside Kronke’s car window of a huge plot of land that a stadium could be built on. That fact alone should piss off any St. Louisan. The man clearly had motives to make this move years ago and was lying to a whole city just to scrounge a few extra dollars from the local fans to attend the games while his team is still here until he got the full authority from the NFL to relocate. For Stan to even have a shot at moving, he knew he had to have the team be a disaster on the field. So he hired a coach who only knew a style of 1990’s era of Football (Fisher Ball) which of course does not work in the modern game. The stage was set and now he just had to play the waiting game of a dwindling fan support for a team that couldn’t even win half their games in consecutive seasons. Best part about this, even in the worst years, the majority of Rams games where all the fans knew Rams would most likely lose, people still filled over half the stadium. That shows true support and heart for the game from the city. Fast forwarding to 2016, the Rams started their season play in Los Angeles. The city where not one, not two, but on THREE different occasions a NFL team has left due to lack of fan support. So what does the NFL do? They not only approve the Rams to move to LA, but the Chargers too. Clearly people don’t learn from history. Now at the time, there were actually three teams potentially looking for a new home. A very popular deal was verbally approved by a few owners that the San Diego Chargers and the Oakland Raiders (which LA actually has a huge fan base for) would share a Stadium in LA and that the Rams at the time got approval for a city funded new Stadium and stay in St. Louis. What does the NFL do? They said screw you to all three and went with Kronke’s plan who said he would build a 2 billion dollar new stadium in LA that the NFL HQ could move into and that the Chargers could be his tenants and Oakland would of course be left out in the cold to figure out a new plan. 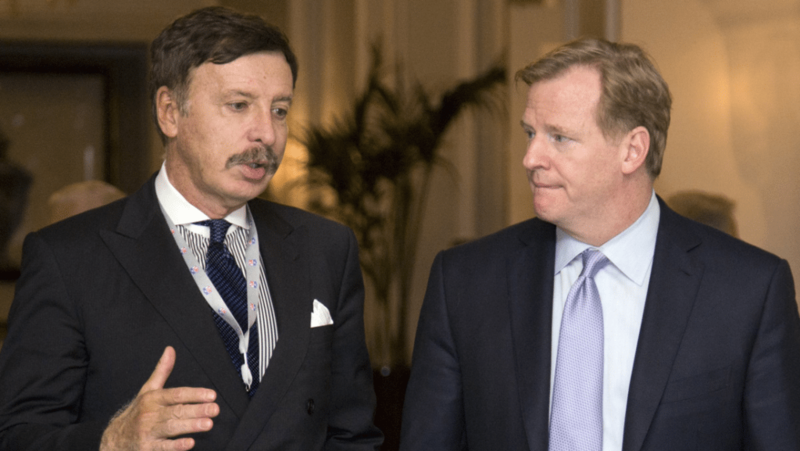 I feel bad for the Chargers in this scenario as no one wants to be a tenant of Kronke, the man is just a crook. Fast forward to 2019, the Rams just appeared in a Super Bowl and lost because they could only a muster a Field Goal while the Patriots and Tom Brady cruise to their 6th Super Bowl win in under 20 years. The Rams getting there is a whole different story as the Rams clearly got favored by the NFL and the refs during the Saints and Rams NFC Championship game where all the Refs where from California and missed a blatant call that EVERYONE (except for apparently the refs who were standing only a few feet from the play) saw that would have sent the Saints to the Super Bowl. At this point, everyone can deduct that the NFL has an agenda to try to build a fan base for the Rams in LA, where it has failed before, by giving them an advantage to excel over other teams. This isn’t the WWE NFL! People pay and gamble for the outcome of each game/play, not for you to script it to your liking and outcome you desire, that’s called collusion in court. But the stats behind the Rams losing is what is fascinating. On top of this most recent Super Bowl having the lowest rated Super Bowl in over a decade, the St. Louis area TV Ratings where only a few points less than LA. LA, the city with over 10x more people in St. Louis, who currently house TWO Football teams while St. Louis has none, only a few points more. That’s absolutely embarrassing. Not to mention that during the playoffs this year, the Rams could barely fill half the stadium with their own fans. Even in their inaugural season of being back in LA in 2016, the Rams still struggled and couldn’t even fill half their stadium for home games. I truly hope the NFL and its owners sees those statistics and realize just how bad Stan Kronke took them for a ride and truly regret approving the Rams to leave St. Louis just so Stan can profit for owning a team in the LA area and doubling the value of the team just for being there. There is even a video now circulating of LA Rams Fans welcoming the Rams back to California from Atlanta after losing the Super Bowl with THREE Fans in attendance. I’ll tell you what, if the Rams where still in St. Louis, they would have 100% sold out every playoff game and that stadium would have been impossible to hear anything with a roaring supporting crowd for the Rams. Hell, even them driving back to St. Louis after a playoff loss, the city would have welcomed them back with open arms of thousands of people as making the playoffs in St. Louis is a huge deal. But 3 people out of over 10 million? Absolutely pathetic and embarrassing for the NFL. My overall point is that I’m pissed about how everything went down. The Rams moved to LA and are having huge success with winning after finally having a competent management and team. They could have done this in St. Louis and had way more support from the local fans than they currently receive from LA. Kronke absolutely trashed the city in his paper that was created to provide reasons for the Rams to leave and majority of it is an absolute lie. A Quote of “Any NFL Club that signs on to this proposal in St. Louis will be well on the road to financial ruin, and the League will be harmed” not only was him giving a giant middle finger to St. Louis with a blatant lie, it was also an attempt to hurt St. Louis of having a chance of getting a NFL team back. The man is just evil from head to toe and Enos Slaughter and Stan Musel (St. Louis Cardinals Hero’s who Stan is named after) would be rolling in their graves for being represented by a man who has such hate for St. Louis. The thing is IF there were facts that St. Louis didn’t support the Rams and IF St. Louis didn’t do everything in it’s power to retain the Rams to include funding a brand new stadium and IF the owner didn’t lie to everyone about his true agenda and leading fans astray to spending money on a product that had no intention of being there and IF the team wasn’t having such huge success in LA because the owner finally decided to invest in good players and management THEN I wouldn’t be upset at all about the Rams leaving as it would have been perfectly justifiable. But that’s not what happened what happened at all so any St. Louis fan has 100% good reasoning for being mad at Kronke and the NFL. Honestly speaking, I actually might one day support the Rams, but only after Kronke no longer owns them. He doesn’t deserve to profit a dime from this whole ordeal and I hope the pending court cases against him takes every single dime he has. So next time you see someone bashing St. Louis for losing the Rams, tell them the facts, because as a city, St. Louis did absolutely nothing wrong. The greed of an evil man looking to make an extra buck at the expense of alienating a whole fanbase and city was the reason for a beloved team for leaving. Until that day happens however, I will not support the NFL and especially the Rams until Kronke is no longer the face of anything but a yellow stone in the ground. On What If The Rams Drafted Johnny Football?